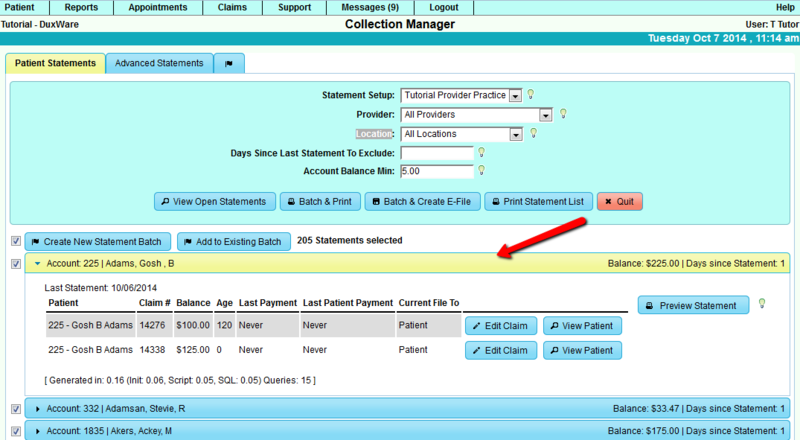 The Collection Manager provides the ability to gather Statements, to create Statements and to re-run Statements. newly gathered batch to an existing batch. is shown on printable statements and how to format it. Refer to the Statement Setup for details. 1. Accessing the Collection Manager and initial viewing. are listed in the Action buttons. claims that are currently on file to Medicare. collapsed view showing the summary of Statements. without adding the preview and print to Statement History. 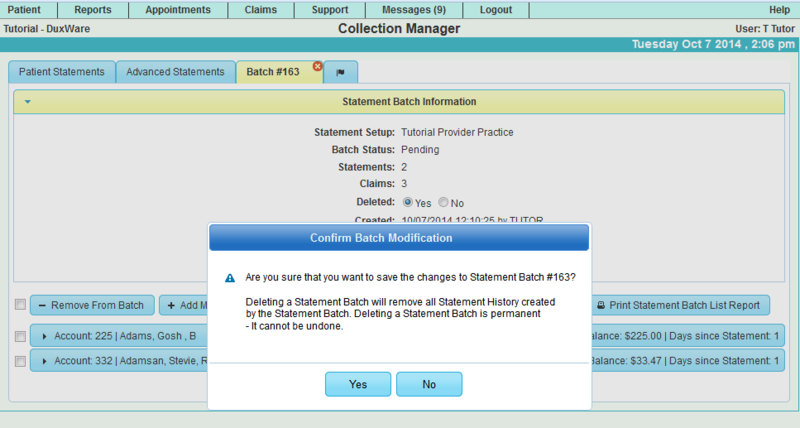 3.3 Choose Statement Batch actions at the time of creating the Batch. action after the Batch is created. View Batch - opens a new tab and shows all Statements in that Batch. Statement History and Filing History. with a prompt for the user to Download the file. This action also creates statement and filing history in the respective accounts. In addition to the same action buttons described in 3.3, more action buttons are available in the Batch tab view. this button will no longer be available. Add More Statements - a prompt to open the Advanced Statements tab to gather more statements and add to the current Batch. Note: when a Statement Batch has been run , this button will no longer be available. Print Statement Batch - creates PDF to print statements in the batch. Create electronic file Batch- creates electronic statement file. Print Statement List Report - Creates a PDF report listing a summary of each account with aging. A Statement Batch can be set as "deleted" by setting the "deleted" option to "Yes" and selecting [Save]. Batch that has been deleted. The user will also NOT be able to undo the Delete. or "No" to cancel the delete. By selecting the "flag icon", the Statement Batch Dialog will pop up and show all Statement Batches that have been created. Deleted Statement Batches can be found by enabling "Show Deleted" in the Batch list dialog. "Advanced Statements" Tab is is basically just a "Patient Statements" tab with additional filtering options. or by type of services. gathering [View Open Statements] result to select which statements to create. 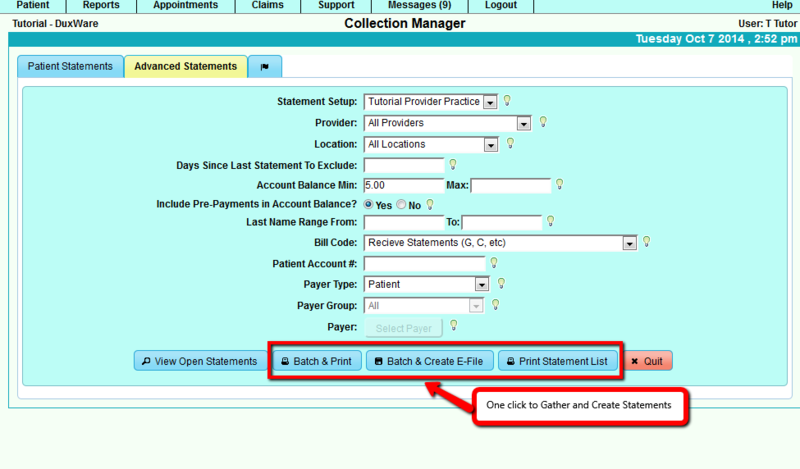 There are three action buttons to perform [Batch & Print], [Batch & Create E-File], and [Print Statement Listing]. Batch and create PDF Statements. to add to a new Batch and create and electronic file to download. Filter options are labeled with self explanatory names and tool tips for additional information. All filter options can be predefined in a Statement Default Setup. Refer to the Statement Setup Guide for details. Statement showing all outstanding patient claims that each Guarantor is responsible for. showing all of their out standing claims. previous statements are combined together as a single line item. gathers Statements unless the option is enable in the Statement Setup or it is overridden from the Advanced Statements tab. This option controls whether or not to include Unapplied Pre-payments when calculating Account Balances. Only Claims with a positive Account Balance are considered. Account Balances must also fall within the Min/Max range. balances to produce a statement. 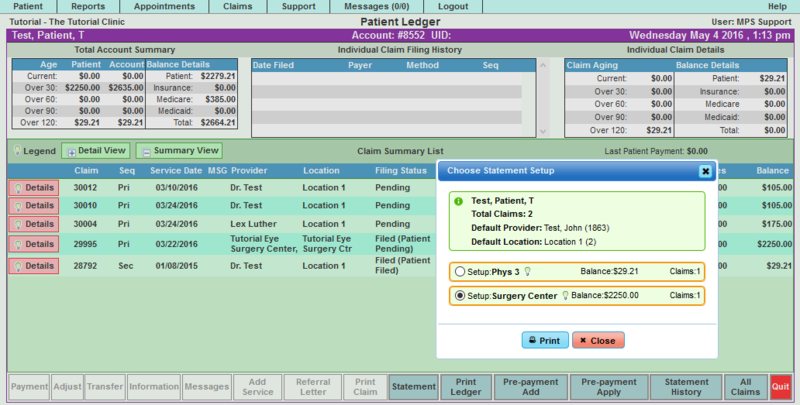 Example 2: a patient has $10.00 in Unapplied Pre-payments, and $99.00 balance due on their account. A statement will generate. Choose (No) to NOT count Unapplied Prepayments when calculating Account Balances. Unapplied Pre-payment is ignored, and a statement will generate for the account. applied to services, are done before a statement run. names beginning with "a" through last names "b". Bill Code: Patient can have different Bill Codes to attribute to whether or not or how they will receive Statements. 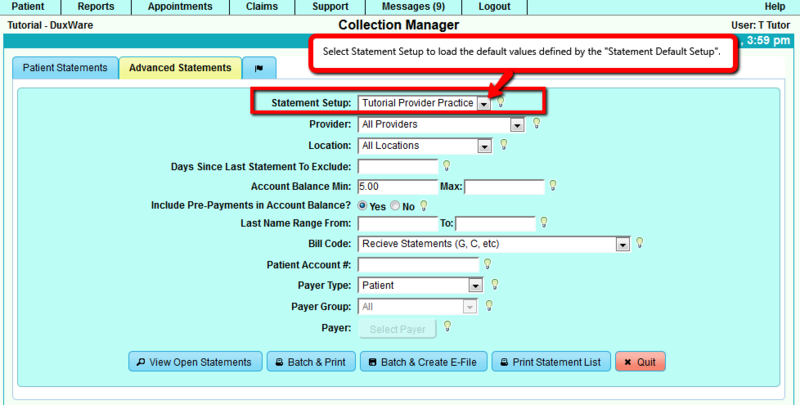 Patient Account #: - if a patient's account number is input in this field, a statement will generate for this patient only. 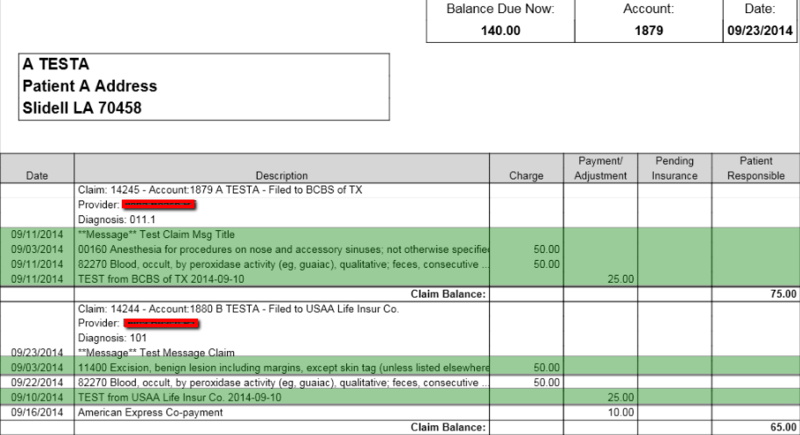 Patient to only send statements for claims that are on file with the patient. Payer Group: - Filter statement gathering by Payer Group. 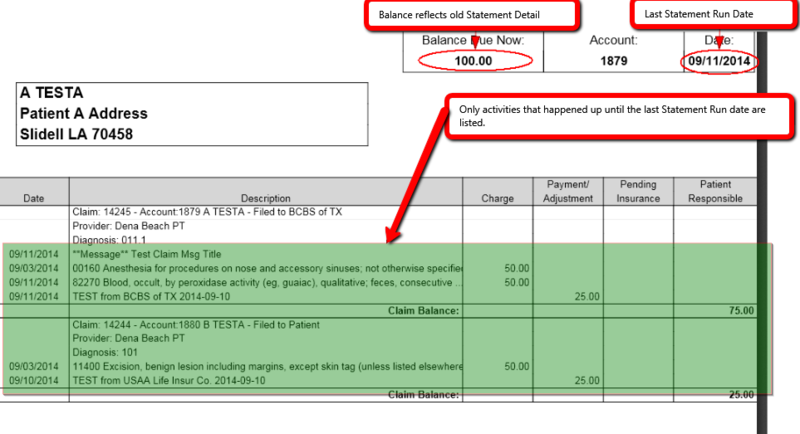 Example of a Statement run on 9/23/2014 with the Balance Forward option OFF, and the last Statement Date was "09/11/2014". The highlighted items above are activities prior to the last Statement Run. In this Statement, there are two claims: 14245 and 14244. Notice Claim 14245 has no activities since "9/11/2014". In Claim 14244, there are activities before "9/11/2014". 1.2 Example of the same Statement Run with the Balance Forward option ON. All highlighted line items in the previous example are no longer listed. The Balance Forward amount and the Claim Balances add up to the Balance Due amount. Claim 14245 has been omitted entirely since it doesn't have new activities. could be different from what was actually sent. NOTE: Statement re-run will NOT create new Statement History or Filing History. 2.1 What can cause Statement re-run to be different? 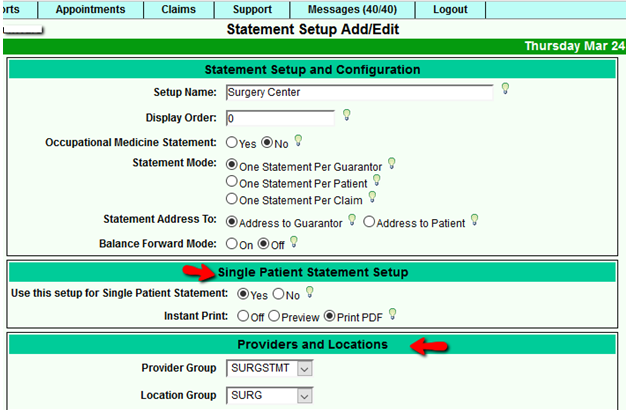 Setup for Statement Mode has changed from Guarantor Mode to Claim Mode. 2.2 What will not cause Statement re-run to be different? posted after the old Statement date. Another example, the Claim on that old Statement is now on file with a different payer. Compare to example in 1.1. Activities after "09/11/2014" are not listed in this Statement re-run example. There are errors that could stop the Statement from being created such as missing Patient Address and a non-billable procedure with charges. and any details about the Statement Error. Statements errors are Red. A dialog box will pop up to alert that a Statement error has occurred after the gathering process. The Statement accordion section will auto-expand to display error details. This page was last modified on 27 May 2016, at 13:48.